Benjamin Cook (NASA Goddard Institute), Toby Ault (Cornell University), and Jason Smerdon (Columbia University) obtained surprising results from computer model simulations. 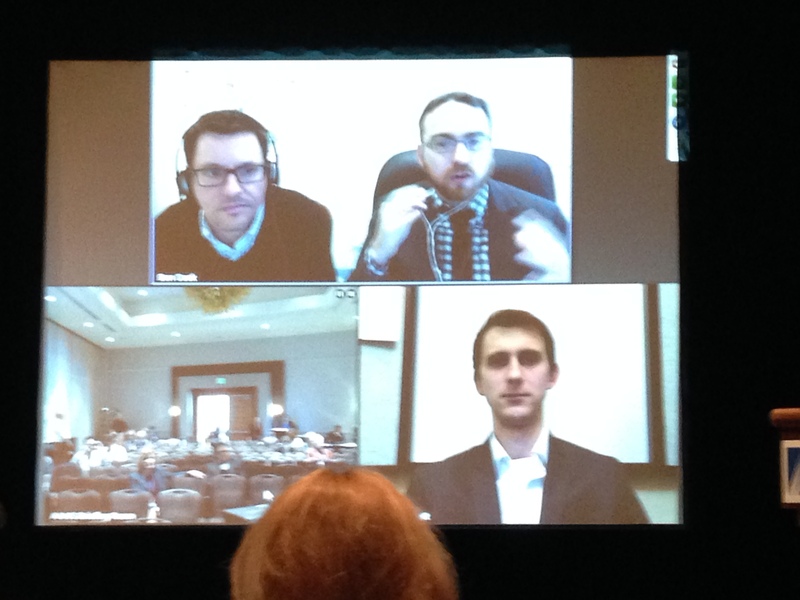 According to Cook and Smerdon, who videoconferenced with a shared microphone, previous models—such as those used for the IPCC’s 4th Assessment Report—underpredicted drought risks. 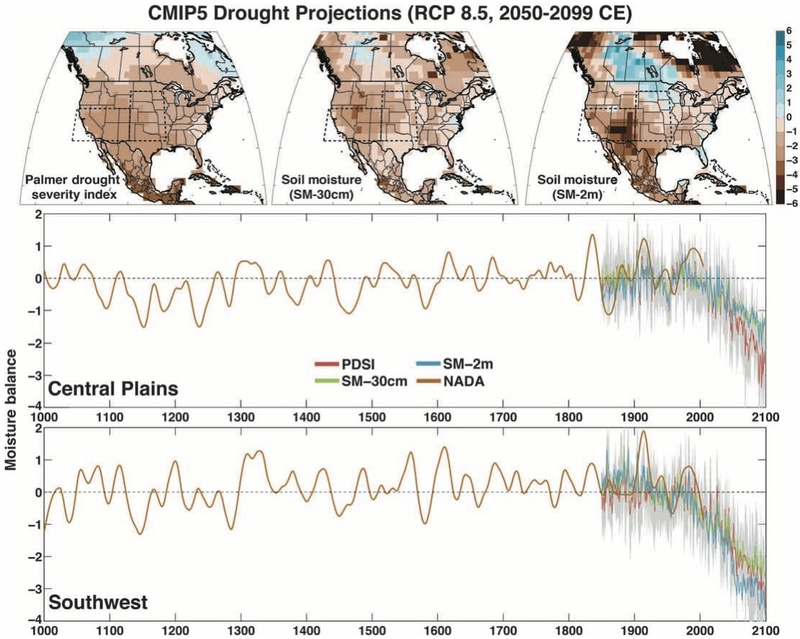 Cook and his colleagues used drought records documented in more than 1800 tree-ring chronologies over the the past millennium, where ring width decreases in dry years, to develop 17 model projections of 21st century climate in the American Southwest and Central Plains. Their disturbing findings include predictions of megadroughts, lasting 35 years or longer, in both regions worse than any seen in the last 1000 years. In short, they expect climate change to increase drought length and severity in the coming decades. The drought risk is twofold, due to reduced precipitation and to warmer temperatures drying out soils of rivers and lakes, in which models predict increasing evaporation. Long droughts due to climate variations have occurred in the past, such as those occurring during the 12th and 13th centuries (the Medieval Climatic Anomaly) that serve as important benchmarks. 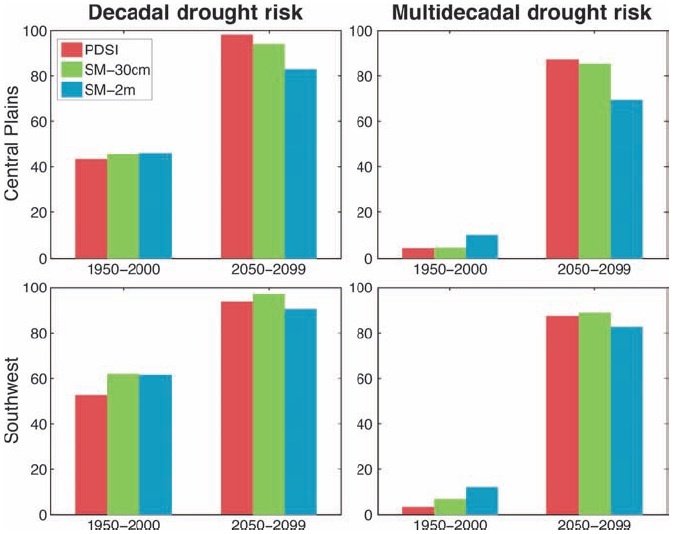 But with their tree-ring based reconstruction of the climate history, in a “business-as-usual” emissions scenario, they predict a “persistent shift in the future toward longer droughts” that could exceed even those of these extremely dry centuries. Ault described how risk assessments are made, in terms of the magnitude of impact and the likelihood. “The levels [of risk] that we see are striking,” with an 80% or higher risk of a drought 35 years or longer in duration by the end of this century if climate change is not mitigated. He described the situation like a golf course, which an initial 10% of it consisting of sandpits. If climate change continues unmitigated, the golf course will gradually become almost entirely sandpits! In the paper, Cook and his co-authors comment on the difficulties people in the Southwest and Central Plains will face when attempting to adapt to these climate conditions. In particular, the current depletion of nonrenewable groundwater reservoirs “will likely exacerbate the impacts of future droughts.” They discussed implications for both the water supply and food supply in the press conference, considering the dependence on agriculture in California and the breadbasket in the Central Plains. “Water security is food security,” as Ault put it, and people need to “take a no-regrets attitude toward preparedness.” Droughts will inevitably occur, and some of them could be as destructive as large earthquakes and hurricanes. Their ongoing research will focus on examining the future severity, persistence and geographical scope of droughts, and they will attempt to improve the spatial resolution of their simulations, which currently employ coarse-grained averaging. They also plan to consider hydrology and snowpack, in addition to soil moisture. In any case, the soil moisture metrics and PDRI all point to one conclusion: unless people find a way to substantially mitigate climate change and prevent rising temperatures, the American Southwest and Central Plains can expect to face megadroughts like they’ve never seen before. Finally, if you’re interested, below you can see my photo from the press conference (and I’m the one in the lower left with a cellphone in front of his face.) In other coverage of these results, see this nicely written Science article by Emily Underwood, and I saw a Washington Post reporter writing an article about it too (but I forgot his name), so watch for that. Honestly I was shocked at the graphic showing extreme low soil moisture in Labrador, Canada. So the northern latitudes aren’t exempt from this potential catastrophic change? Thanks, that’s a good question. Yes, it appears that the northern latitudes are not exempt, but they are much less vulnerable than the southwestern US and Mexico. It would take a long time to experience “catastrophic change” in the north, even with continued high levels of carbon emissions. However, I should point out that these scientists’ models have limited spatial resolution, and in their future work they will be able to make more accurate predictions about specific regions. Thanks for stopping by. Appreciate your research.